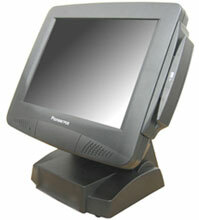 The Pioneer Magnus XV is the most powerful and versatile 15" touchcomputer in the market. It is powered by Intel's Pentium Dual Core or Core 2 Duo, and has a blazing Intel 10/100/1000 BaseT network built-in with vPro technology for remote management. The Magnus XV will be ready when your business grows and has more data to process, offering a better return on your investment. The Magnus XV's built-in RAID-1 option allows automatic hard drive mirroring thus providing data redundancy and protection. By using 2 hard drives, your data will be continuously duplicated onto the second drive. If one drive fails, Magnus XV will automatically run from the second drive, thus reducing down time. Plug in a replacement drive, and the Magnus XV will re-build the new drive by itself. The Pioneer SE1KXR000A11 is also known as PioneerPOS	PIN-SE1KXR000A11	.